On a busy summer weekend, my husband and I launch our kayak down the Siltcoos River Canoe Trail, and in moments find ourselves in absolute quiet and solitude. Well, quiet, that is, if you don't count the flap of osprey wings overhead, or the creaking of trees swaying in the wind, or the tweets and twitters of countless songbirds. We learned of the water trail purely by chance at a water-sports shop in Florence, a small central-coast town at the north end of the Oregon Dunes National Recreation Area. The canoe-trail brochure shows a crooked river cutting through the wilderness, and promises a sense of adventure from the very start. For this pair of proud new tandem-kayak owners, it's much too tempting to pass up. The starting point of the river trail is on Siltcoos Lake in Dune City, about eight miles south of Florence, but on this day, we opt to set off from the Lodgepole Picnic Area roughly midway along the trail. The river is wide and flat, with dense forest and thick underbrush on either side. We round a corner and the trees thin, the tangled underbrush giving way to sand and dune grass, and I can just spot the tips of the tallest ocean waves. A few strokes more and we are surrounded by the white expanse of sandy beach. Just ahead is the pounding ocean, today colored the blue of the Caribbean beneath an equally azure sky. A snowy plover flits over the water, disappearing into the dune grass. To our left, on the ocean's edge, a pod of seals-their sleek coats spotted in white, tan, silver and black-relax lazily in this idyllic land.. Leaving the seals to their sunbathing, we turn back for the forest, continuing our journey toward the other end of the trail. Soon, towering dunes peek from behind the narrowing forest, and wild rhododendrons add a splash of lipstick pink to the setting. We navigate a maze of old fallen trees, portage a small dam, and the landscape changes yet again. Children swing on an old ; small boats bob and sway at the dock of a marina; and a row of turquoise patio chairs lines the deck of a small cottage, a perfect front-row seat to the river scene. An hour and a half after leaving the ocean-front, we emerge from the dunes and forest onto Siltcoos Lake and still another landscape; at its center is the calm expanse of the lake; on its edges, the rolling lush green of the Oregon hillside. 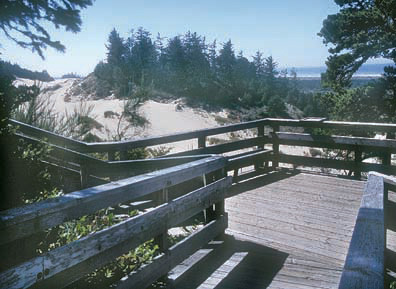 And all of this is just one small part of the Oregon Dunes National Recreation Area. Although its name suggests a desert landscape, the ODNRA, officially designated as such by President Nixon in 1972, is so much more. Yes, there is the sand-the greatest expanse of coastal dunes in North America, no less-with wind-sculpted drifts rising as tall as 500 feet above sea level. Hike across a sandy range, and your imagination can easily conjure the Sahara. But on these 31,500 acres-an area roughly 52 miles long by 3 miles wide-you'll also find some 30 lakes and streams, tiny islands of coastal brush and wildflowers, and dense forests of Douglas fir, cedar, hemlock and spruce. Wild berries-black, salmon and huckle-grow here in abundance, and hundreds of species of birds, as well as deer, black bears, elk, lizards, squirrels and other critters call it home. There are at least 14 established hiking trails, numerous boat ramps and more than a dozen camp-grounds. It's a lot of ground to cover, making the Oregon Dunes Visitor Center in Reedsport a good place to start. Here, you'll find information on camping, hiking, bird-watching, berry-picking, boating, riding and fishing. In other words, if you can do it, see it, hear it or ride it in the dunes, odds are the staff at the visitor center can light the way. It's also a good place to learn about issues facing the dunes, such as efforts to eradicate European beach grass, an invasive species that threatens to disrupt the area's environment. While the grass is proving a nuisance, park officials promise progress is being made to preserve the dunes for future visitors. My first introduction to the dunes came 10 years ago, when, as southern Oregon residents, my husband, son and I made the three-hour drive to camp there. It was unlike any place we'd ever been, endlessly changing from one mile to the next, always offering something new to explore, and you couldn't (and still can't) beat the price-a few dollars for the day-use parks, and not much more for a campground spot. Any given afternoon might find us swimming in a hidden lake, walking on the beach, scouring the forest for berries, or, as on one dizzily memorable afternoon, sailing across the sand in a dune buggy. Our son, Dustin, then 11, had begged for days for a ride, and we finally gave in and signed on for a tour with a guide. Seatbelts on, helmets and goggles securely in place, we raced up the steep side of a dune, spun around, dropped over the crest, slipped along the side, zipped back to the top, then down again. And so it went for the better part of an hour, sand flying as we soared and swooped across the dunes. Dustin thought he'd just discovered the coolest thing since Disney World. I wondered if I'd ever regain my equilibrium, though I had to admit we'd covered more ground in this vast sandy expanse in an hour than I'd ever manage on foot-or otherwise. A decade later, I still favor quieter pursuits on the dunes. I live closer now, only an hour away, which means I often sneak out on a whim for some new dune exploration. Such is the case one early spring when sunshine, blue skies and mild temperatures make staying inside impossible. I've passed C&M Stables, on the outskirts of Florence, countless times, always curious about the signs posted along Highway 101 pointing the way to the Coast Horse Trails. I call ahead to schedule a ride, and arrive just after noon to find Adam, a trail guide in his early 20s, shooing horses from their stalls, sending them out to play in the hillside pastures. Soon, he brings me Keno, a 19-year-old paint with blue eyes and a quiet demeanor, a trait I note with some relief. It's been years since I've been on a horse, and I'm hoping for a ride more on the side of mild than wild. The other riders are Mary, a newcomer to the coast, and her guest from Texas, Liz, a onetime barrel racer, who hasn't been astride for 20 years. Adam goes over a few pointers; how to hold a split rein, how to pull it out and back to guide the horse, how to place your feet in the stirrups, toes pointing skyward, heels down, and how to give a tap just by the girth when a quicker pace is desired. Single file, our horses carry us from the corral to Highway 101. Adam checks for traffic; we follow him across the two lanes, along a gravel road, and then into the woods, down a muddy trail, through trees and thickets of brush. Before long, the ground underfoot grows sandy, and we clear the woods, breaking out onto the grassy dunes, just on the edge of the ODNRA. There's a small river to be crossed, which Keno isn't so sure he likes. I give him a tap, and he makes up his mind to carry me across. We climb up over the dunes and down again, through sea grass and marsh until we come to the beach, where the surf laps across the sand, leaving in its wake skittering bits of foam, and gulls glide and dive, always on the watch for a morsel of food. This wide-open expanse is the horses' reward after the slow, sometimes narrow trail, and they seem to know that. Almost immediately, Keno picks up the pace, and soon I am trotting down the beach, bouncing in the saddle and grinning in spite of myself. We let the horses frolic for awhile before turning back, this time wending our way over a trail along wetlands, over hills and finally by a pasture where more of C&M's 50-odd horses romp and graze. Adam tells us it's not uncommon to spot black bears foraging for berries, and red-tailed foxes, deer and elk are also common sightings on the trail. But today, it's just us and the horses, and you won't hear me complain. A sunny day on horseback by the sea seems about as much as one soul might request in a day. I finish my afternoon in Florence's historic Old Town, a little neighborhood of boutiques, souvenir shops and restaurants on the banks of the Siuslaw River. Incorporated in 1893, the river-front community grew around the area's rich fishing and timber resources. The bridge linking Florence to the rest of the coast was still more than 40 years away, but the Siuslaw River served well as a marine highway for commerce and travel. Today, with its pedestrian-friendly streets, river-front gazebo and restored old buildings, Old Town retains an air of that quieter, slower era of 100 years ago. Shops feature a mix of quality art, from artists both local and from afar, as well as glassworks, books, clothing, wine and souvenirs. At a restaurant on the waterfront, I treat myself to a cup of clam chowder and grab a window seat. Soon, the Westward Ho!, a triple-deck sternwheeler, gracefully floats by, decks spotted with guests on a dunes-area tour. I'm told that on this tour they'll get a history of the bridge, pass a corm rant rookery and learn a bit more about Old Town's early pioneer days. It seems someone is always coming up with yet one more way to explore this place. I like to think I've only just begun.